Americans generate 4.5 pounds of trash per day — enough trash to cover the state of Texas twice annually. 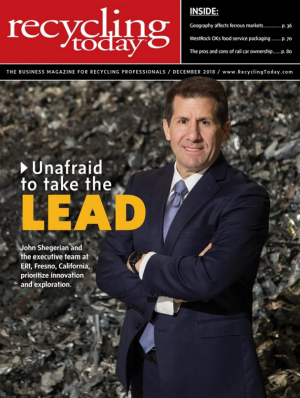 Rather than participating in the take-make waste cycle, ERI® was founded to capture the electronic materials that were destined for the waste pile and convert those materials back into the raw commodities that are required to create new products. A “Cradle to Cradle” approach is one that ensures that as materials finish their useful life cycle they are recaptured and broken down into the elements that were originally used to create the product and reused in the creation of the next product or products. By commoditizing all electronic waste, we are able to help protect the environment, create jobs and save energy that would have been needed to mine and process the original raw materials. While ERI does not manufacture electronic devices, the company’s sustainable activities surrounding the processing of electronic waste are led by the guidelines developed by the Basel Action Network. ERI is proud to be a founding member of the e-Stewards program. ERI is also a member of the National Center for Electronic Recycling, Environmental Entrepreneurs and Environmental Media Agency. Working with these various organizations provides ERI a voice within the industry and helps keep ERI connected to new and innovative activities. Changed lighting of the facility to energy-saving fluorescent bulbs. Reducing our need for oil at the same time. Switched to 100% Post Consumer Paper and Soy-Based Ink.